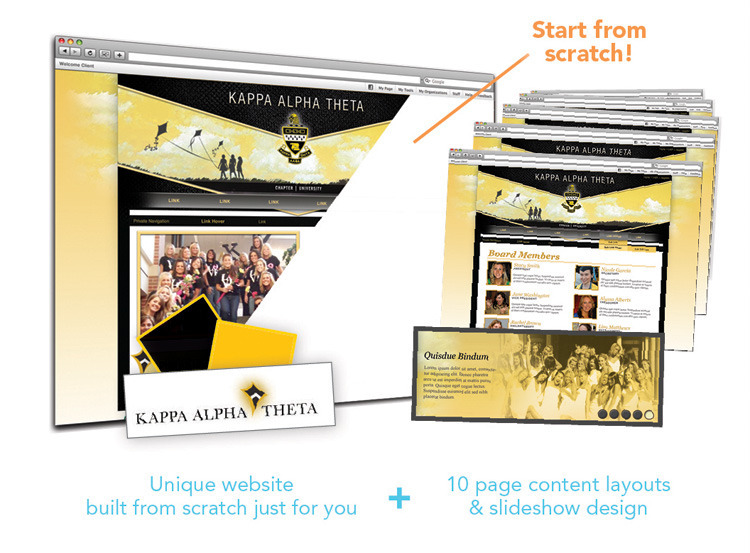 Showcase your chapter's personality with eye-catching design. When recruitment starts, where do you expect your potential members to go to find out more about your chapter? Your audience lives online, and first impressions are big. Therefore, recruitment starts with your website. Your national headquarters' website might sum up your fraternity or sorority's mission, but it won't reveal the personality of your chapter. A website that consistently represents your organization's logos and colors. Your own private social network, free with your websites. Nearly everyone in your chapter uses Facebook—but it’s difficult to target online fraternity or sorority planning and communication in such an overwhelming public environment. What if you could have your own private social network where you and your chapter members could interact, plan, schedule, task, communicate, grow and build an identity for your chapter? Unless you’re a computer science major, you may not have the programming expertise to add content or make edits to a coded website. Celect’s content management system (CMS) is easy for any college student to use. Edit your content right on the page, no coding or programming necessary. It saves you time and money and gives you the opportunity to keep your website fresh as your chapter evolves. Member profiles help you cultivate relationships within your chapter. Celect’s profile feature gives your members the ability to share information within your chapter’s community that they might not want to share on a public network like Facebook— like phone numbers, alternate emails, street addresses, messenger accounts and more. While members have the ability to only share designated information, your site administrator has access to everything. Knowing about your members is a crucial part of building your community into an effective networking and social organization. A secure, quick way to process credit card transactions for due payments and more. Process orders for t-shirts, outings, events and more. Open your chapter to donations from alumni or alumnae. A special offer for Greek Chapters, Celect's Branded Package is a quick, easy way to jumpstart your new website design at our most affordable price. This option includes all features of the Celect platform. Pick one of your organizations's branded site options. Work with our design team to add your chapter’s name and unique identity. *The Branded Package is a specialty package offered only to Greek chapters through an agreement with the associated National Fraternity or Sorority. Please contact our sales team for more details on your chapter's eligibility.